The following is a guest post. David Bach coined a term in his book Finish Rich called “the latte factor.” It is the simple idea that the small trivial things we spend on everyday adds up to an extremely large amount over time. 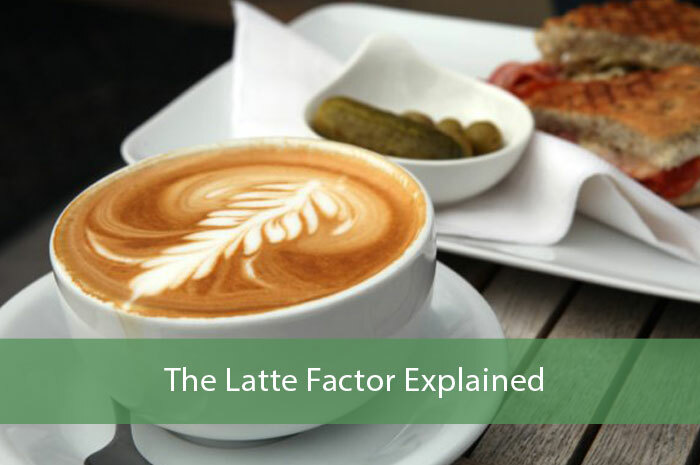 The “latte factor” is actually somewhat of misnomer as it covers a lot more than lattes. It can be the candy we buy to snack on out of sheer boredom. Or the cigarettes we buy because we just can’t shake the nasty habit. Or the subscriptions to the magazines we don’t read but are too lazy to cancel. Heck it can even be the miles that we drive to work everyday. The latte factor is the unconscious spending on the little everyday things that do not add any value to our lives. Let’s discuss more about the latte factor and how it can help us get a better grasp of our everyday spending and save a bunch of money at the same time. The math behind the latte factor is pretty solid and makes absolute sense once you think about it. A latte at Starbucks costs $4. Let’s say you save that $4 instead and invest it. 40 years down the line, that $4 becomes almost $30 if it grows at 5% annually. How about growing at a rate of 8% annually for 40 years? That’s $98.10. That’s right. $4 growing at 8% interest turns into $98.10 in 40 years, compounded daily. Just go ahead and plug those numbers into any compound interest calculator and you will invariably get the same results. So while you are spending $4 on a latte everyday, you are actually foregoing $98.10 in future income. Of course you can’t simply just put in $4 here and there into an investment account (as that would cost than your actual investment). But the point is to think about what that $4 means in the future. How much do you spend on frivolous items weekly? $100? $200? I know for years my latte factor was eating out during lunch. I ate out at lunch almost everyday. I ate out because I was too lazy to make food at home. It wasn’t because I didn’t have time—it was just that I didn’t want to be bothered to go to the kitchen to make some food for work the next day. So each week, I would spend about $50 on lunch. For a month, that’s about $200. For a year, that was $2,400 in lunch. Instead of eating out everyday during lunch, I could have saved that $2,400 and invested it at the end of the year. What would that $2,400 be at the end of 30 years, growing at an annual rate of 8%? That would be slightly over $26,000. What about 40 years? That would be almost $60,000. The latte factor teaches us about the dangers of habitual, unconscious spending. Spending $3 here and $5 there won’t mean much during the transaction. However once you get a bird eye’s view of your daily spending, it will present a much clearer and more ominous picture of your personal finance habits. Recognizing the latte factor has to do with changing the very habits that we act on every day. Changing habits does take time but it helps if we are able take a long-term macro look at our spending. Often we rationalize our actions by saying “oh it’s just $2 this one time. I will be the last one this month.” However, will it be? The latte factor isn’t something that is going to make us rich (alone). However, it is something that can save us a whole lot of money and it is something that can bring about discipline in our spending. 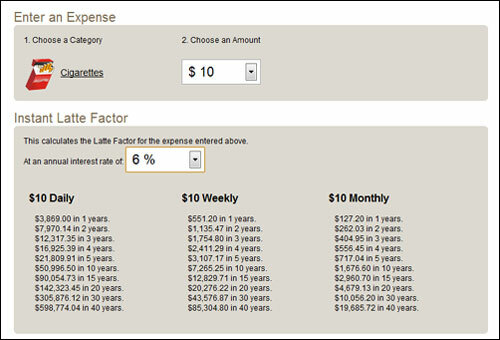 To figure out how much you will save with the latte factor, use David Bach’s latte factor calculator. To see how big of a saving it is, just go ahead and plug in the numbers into David Bach’s calculator. Instead of spending that $10 a day on different small item purchases, if you were to put that into an investment that yielded a 6% return on your investment, over the course of 20 years, you will have accrued $142,323.45. You can try out the latte calculator for yourself and see how much your latte factor is costing you. This scenario is calculated on your right. Saving $10 a day is not that hard. At the end of the month, it is just $300. Saving $300 a month becomes a lot easier once you start realizing a lot of the spending you do on a daily basis does not bring about any type of long term value. Taking control of your latte factor means the willingness to give up on the little things for the sake of big wins (those that bring long term happiness and value). It calls for discipline of your spending habits. However, a total stoppage of something we enjoy and do everyday is extremely hard. And honestly, I do not advocate for that, and I don’t think David Bach does either. I do love my occasional Starbucks or lunch at a restaurant—and calling for a total stoppage is somewhat impeding my freedom to enjoy a little bit of what my money affords me to do. I do not advocate hording all your money until retirement. What is the point of earning money if we cannot enjoy it right? That is why changing our spending habits involves little adjustments, instead of complete 360 changes. Instead of having a coffee everyday, you might try having it every other day and then bring coffee from home on the days that you do not buy coffee. Or instead of eating out for lunch everyday, try eating out every other day. The fact is that some of the small everyday items we buy are some of the simple joys of life—and the joys of being able to spend the money we work hard for. The true purpose of the latte factor is to look at our everyday spending and see how we unconsciously spend on things that do not matter to us and brings us no long term value or joy. That is the stuff that we should work to eliminate. Everyone has their thing that they love spending on—be it latte everyday or shopping every weekend. I don’t think we should just stop spending on what we love for the sake of compound savings 20 years down the line that we might not even see. The main point is to isolate and cut frivolous spending and cut back back on things that does not provide long term value. Cancel that gym membership that you don’t use. Cancel that subscription to the WSJ if you only read the premium version a couple of times a month. The point of the latte factor is to not make you rich—it is an idea used to make more conscious spending decisions. Curbing unnecessary spending, actively saving money, and investing wisely can make for a very fruitful retirement without having to totally abstain from enjoyments of our youth. Eating out and coffee are some of the first things to cut down on when people first take control of their daily spending habits. But there are many other things we can do to save more money everyday. If you only go to the gym once every other month, maybe it is time to cancel that gym membership. Instead of driving to work everyday, maybe you can try busing to work or finding a carpool partner or a vanpool. You don’t watch most of the channels on your tv? Perhaps you should cancel the overpriced cable subscription and get Netflix and/or Hulu. If you have an individual cellphone plan, you should think about bundling with family and friends. These are just a few things we can all do that can save us literally a few hundred a month. Take a look at your spending habits and see what kind of unnecessary spending you can cut out of your life. We have talked about the latte factor as a way to save and think about money. However, we should really know why we are saving and abstaining…right? As Ramit Sethi said in his book I Will Teach You to Be Rich, saving is most effective when you have a goal. What are you saving for? What is the ultimate reason you are foregoing that cup of coffee today? Without a purpose, foregoing a cup of coffee hardly seems worth it (to me). However, if I tell myself that I am giving up this cup of coffee today so that I can have more money for the down payment on my house, then it excites me and gives me a real goal in saving—a real purpose. The big takeaway from the latte factor is to find out what really matters to you and what really doesn’t and putting your priorities in order. The road to financial wealth won’t be easy, however, knowing what you need and what you don’t need will really help you as it might save you from taking out a loan or spending too much on your credit card. Remember, save wisely and with a goal. The latte factor makes sense to a degree, but I’ve never been the type to fully sport it. I don’t believe in depriving my self of certain things I enjoy. Sure we all waste money on things that could be potentially saved, however to someone that $4 latte is an important part of their day. It may be their little “zen” moment or simply starts their day off right because its incorporated into their routine. I’ve always said: Budgeting/Latte Factors etc.. don’t need to be all or nothing. Compromise and balance is key. Hi Eddie, thank you for your comment. To full abstain from the small pleasures of life to live a comfy retirement seems like a thing of the past. I also don’t believe in it. However, I do believe that we should try to cut out unnecessary spending whenever we can though. If coffee every morning is your thing, by all means, I think you should indulge in it. But there are many things that we generally can cut out of our lives that can save still save us bunches a month. Good suggestion on how to better balance it Joe. I could see people getting carried away with the latte factor and just not being able to stick with it. By making those rewards less frequent they’re also likely to become more enjoyable since it’s not just a regular part of your routine. I used to be horrible at buying lunches and dinner at work. The problem with bring a lunch was that since I met clients on the road frequently, bringing a lunch and leaving it in the car seemed like a bad idea. Also I was lazy. In terms of buying lattes, I still indulge in a Starbucks drink once in a while. I can justify it as a treat. The reason I limit it isnt because of the $5.14 my drink costs, but because of the amount of sugar that’s in there. Heh I thought I was bad. Lunch AND dinner? That can get quite expensive pretty quick, especially dinner. Dinner is easily double the price of lunch around here :X.
Heh you are definitely right :). I did not factor in grocery spending for the sake of simplicity—and that invariably leads to a bit of fuzzy math. But you can still save quite a bit after factoring in the groceries…and believe it or not, hiring a cook to cook a full week’s of lunch and dinner is still going to be less expensive than eating out for lunch and dinner for a week :). I think everyone is different and of course everyone can utilize this chart and these tips to fully understand the latte factor. However, some people like to cut the larger items like mortgage/rent/housing and indulge in the smaller items once in awhile. There is no right or wrong – that’s what makes it personal finance. It’s pretty excessive to buy a latte everyday, but I think this idea has been pounded into our heads that the little things add up, and obviously if we invested our money instead of spending it on little things, we’d have a lot more in the future. Heh, I personally don’t think it is excessive at all to buy a latte everyday. Plenty of people do it at my office and I think it just becomes the norm…going on coffee runs. It’s especially hard when you live in Seattle…where there is a Starbucks every corner….LITERALLY. I’d have to go with Joe and agree that a latte every day is excessive. If someone is going to have a splurge like that every day they should at least go for the cheaper option some days. The big problem many people face is that they see lots of other people having their daily lattes and feel there must be nothing wrong with it if others do it. I’m obsessed with minimizing my latte factor. Lunches out, coffees, paying for parking – I’ve tried to cut it all out (except for maybe a once-a-week treat). My plan is to put it all into an account for a down payment, and I’ve been doing just that. Nice! It’s nice to see people being proactive about saving and doing something that increases their net worth. Did you have trouble giving any of it up? I like the treat once a week concept… I think that’s essential to avoid frugality burnout! I’m down for that concept too as long as you can stick with only having it once per week. Sometimes circumstances change and you start justifying having it more often. I wrote a blog post about my clever solution to my latte habit. Lattes are just something I can’t live without. Wow $25,000 in savings is HUGE! A $500 upfront “investment” saved you tons of money on the backend. It’s crazy to think about how much these little things add up. It is amazing to me when you think about how saving on the little things can really add up. I’ve all but given up all the small things in my life. Now, I just need to work on saving even more on the big things to really make a difference in growing a savings for retirement. Heh, well tea is definitely less expensive than a latte…especially if you don’t get it at Starbucks :P. Like the article said, the latte factor is a misnomer because it can basically apply to anything. What do you think are some of the big things people can save on? I hear about this a lot, I just didn’t know that it had a name. The Latte Factor. Of course, I wouldn’t be caught dead drinking a froofy drink like that. I do eat out at lunch most days though, that’s probably my latte factor. It’s hard not to because I’m always out at job sites. There isn’t some office fridge that I can use. But I could pack more sandwiches, that would be an idea. Yeah that’s what most people do at my place. Pack sandwiches…even with fridges and all. Seems to be the easiest thing to make. There are lunch boxes that you can buy that can keep your lunch cold for hours though…if that’s the way you want to go. I especially like the part about having a goal in mind… it’s easy to rationalize anything like this as “only a few bucks”… but when you have defined goals, it becomes far easier to forego these amenities. Defining goals is a huge part of any plan or cost-cutting, at least for me. Definitely. This did not resonate with me until recently, after reading Amit Sethi’s book. That’s really when I started to think seriously about saving. My solution to this is to have a set amount each week as “play money” that I can spend however I want. If I want a latte or eat lunch out, it comes out of that. But once that money is gone, no more lattes, lunches out, etc for the rest of the week. It’s a good compromise for me. Sounds like a good solution to me. If you aren’t keep track of how much play money you’re spending, it’s easy to let it get out of control. A set limit take care of that. I agree that trying to evaluate the latte factor doesn’t mean someone has to change completely. But I’d argue that plugging those numbers into the calculator would make certain people want the latte (lunch, dinner, whatever it is they spend on) a lot less. I already knew it’s not the most responsible thing to buy lunch every day. But seeing how much I could have saved after a year and how that could grow when invested actually makes me think about the big picture a lot more. And thus eating out to lunch doesn’t seem nearly as enticing as it did before. Yes it’s much easier to justify when it is just $5-10 here and there. When added all up though you really get a sense of how big an expense it is. Also factoring in the potential investment interest just further highlights that. I’m going to have to analyze my expenses and see what could be classified into the whole latte factor. My budget is pretty bare bones these days though. Yeah no kidding. Now I cringe at paying $3 for buying a can of Red Bull. I like to cut back but not deny myself out right. That’s like a big automatic failure for me. For instance–I’m a book fanatic. It was so hard for me to stop buying them because I was used to grabbing a book or two (or ten) weekly. After looking at the sheer amount of money spent on books alone, I limited myself to a) only certain titles until the massive amount of unread ones are gone and b) that it had to come out of my play money. It really helped me to put it into perspective by asking what I could have done with that amount if I hadn’t bought a book. I was also horrible about eating lunches out even though I had packed one. It was only a few dollars right? Sure, only a few dollars a day and my lunch that I packed was typically thrown out because it went bad, so that’s money I lost too. Now if I find myself reaching for my wallet, I remind myself that that’s money that could go to my efund, car fund, wedding fund…the list just goes on. (I will admit to not bringing money for a while just until it sunk in). Sounds like someone needs to consider buying an eReader. That would save a lot on your reading and still fill your desire to read. Or you could try borrowing books from the library. Sometimes some of the habitual spending can actually be replaced by a cheaper option. As for buying lunches, that is a lot worse when you are also throwing away a packed lunch some days. I was pretty bad about buying lunches. I think I’d be a lot better now that I’m so focused on eating healthy. I’d just feel too guilty eating fast food regularly. I consider nonfiction books one of the best things you can spend your money on.. It does bring about a lot of long term value. I wish I had your obsession :X. But Jeremy is right, Ebooks cost a lot less and save quite a bit of space (at the same time). I’ve thought about the ebook but I’m back and forth on it. It will probably happen–and I’ll just keep my absolute favorites in actual book form but I’m not sure when I’ll get there. And a lot of my books come from the library now. I’ve found that I don’t need all of them–I only want certain ones! I ended up getting an ereader, but it happened to be a bit after I started taking advantage of the library. For me the library wasn’t very practical considering how long it takes for me to get through a book. I just don’t sit down and read often enough. I’m with Eddie in that I don’t want to give up EVERYTHING I enjoy. My wife and I have a specific category in our budget called “blow money.” We each get a pre-set amount every month to spend on whatever it is that we wish. Sure, could that $160/month go towards debt or saving for retirement? Sure, but I’m all about finding some sort of balance in life. It’s great to make progress and discover where you’re really blowing serious cash in your budget, but it is okay to enjoy life and have some fun once in awhile. I’m sure you do a pretty good job with your budgeting Jason. You do have to fit in some happy spending. I think the latte factor is more for people who are in denial about just how much the various habitual spending is costing them. I’m glad you qualified it with not going too extreme. Or hoarding everything till retirement. I, too, think we need to be responsible and conscience consumers, but also agree that deprivation is not the way to a happier lifestyle. Eating out at lunch was my financial vice for so long. Haha, I’m a boring spender. I’m glad I’ve kicked the habit. If wasting money on lunches makes you a boring spender, I was the king of boring spending for a long time. That sugar and salt packed food just gets addictive, especially when coworkers are eating it too. It just makes a packed sandwich unappealing. I interpret the Latte Factor as eliminating waste rather than looking for all little things to cut down to save a buck. It’s not about being frugal … That way you work towards improving something that you are not satisfied with that eventually cost you money. In most cases, you are already feeling it’s wasteful and you want to change but it’s hard. Yes it is the regular routine purchases that create a lot of waste. The problem is that people can justify that a latte or cigarettes gives them enjoyment that makes it worthwhile. Their addictions lead them to consume these kinds of things very regularly, but in many cases that little bit of enjoyment just isn’t worth it. I know some of my addictions sure weren’t blowing money on all the time. I agree with the latte factor. If you continue to drip small amounts – over time it will result in a large sum being lost. <– you can't deny this.. But I'm a fan of Ramit. Yes – we can focus on small things and budget and not eat out and not drink Starbucks BUT can't our focus be elsewhere? Why don't we instead focus on big wins? I would much focus my efforts to earning 20k more per year so that I CAN eat out and not worry about it. The point you made about spending $50 a week on lunch or $2400 a year on lunch —- even if you made your lunch everyday, you're still spending SOME money. For me – there isn't much of a difference in cost if I eat out or eat in (unless I buy in bulk). This will certainly change when I have a family. It would be pretty awesome if everyone did have the power to just work a bit harder and make significantly more money. Unfortunately lots of people are either limited in their careers or are just too lazy to pursue work outside of their daytime jobs. For people in those situations, it is much easier to get that ‘raise’ by cutting back their spending. Like any financial advice it won’t always apply to all situations Of course you could pull a Warren Buffet and still be super frugal even when making extra money. So instead of just making that extra $20k/year, you can add in the extra $2k or whatever. As for packed lunches being nearly as expensive as bought lunches, I used to use that excuse. Really that just means that you’re opting for the more expensive packed lunch options. There’s lots of decent lunches that only cost a dollar or two. Dinner leftovers often fit into this category. Yes increasing your earnings will definitely help. I’ve been lucky in that my salary has seen big increases every year since I’ve started working. But my big fault was that I was spending more of the money too…A LOT more. That was my mistake. I think a lot of people make this mistake. So earning more money is definitely great…just be sure to not increase your spending by the same amount…then your you savings rate would never increase :X. It is definitely good to give yourself a treat once your salary increases…but I went overboard :(. I’ve gotten into the bad habit of buying lunch at the convenience store. I just feel bad about using their bathroom all the time and not buying anything. That’s probably a pretty bad option though. Most convenience stores have overpriced, unhealthy processed foods. You’d probably be better off packing a lunch and just buying a lottery ticket from them every other time. Or sneak around back and quick pee beside the dumpster when nobody is around lol. What could possibly be unhealthy about nacho cheese? 🙂 I do try to grab healthier options. One of the stores partners up with a local Mexican resteraunt to serve burritos that are made fresh daily from ingredients that can be pronounced 😉 That’s usually my first choice. Mmm those burritos sound good. That’s probably a fairly healthy option despite being from a convenience store. LOL this made me laugh. I too do feel bad. But I grab a stick of gum instead of buying lunch. I’m a huge David Bach fan. I love all his books. The Automatic Millionaire where he goes into his Latte Factor and explains it is by far the best. Great run down of it here! Some of his material is great but others is definitely off. He’s a bit old school….he’s definitely in the camp of deferring present happiness to retire rich. I remember listening to his audiobooks last year and he was touting how great of an investment real estate is…made me laugh. OK, I can see that that calculator is going to become addictive – and enlightening. I do have a Starbucks thing, but try to limit myself to one indulgence a week. I know a lot of people who justify those luxuries by incorporating them into their larger budget – ie, a friend who doesn’t really count her 2 bottles of wine a week because they’re part of her grocery budget (she trims the fat there in other ways). To me, that’s kind of cheating! I shake my head when people say it’s budgeted for when they are wasting money unnecessarily. Just because you add something into your budget it doesn’t mean that it’s not affecting your finances. It kinda defeats the purpose of even budgeting in the first place. That latte myth has been debunked in a new book that explores the dark side of personal finance. The theory goes that if we forgo our daily $5 trip to Starbucks and invest the money, we could end up with a stash of $2 million by the time we retire. Flat wrong, says Olen. A more likely (though still optimistic) outcome is a nest egg of around $170,000. “Not chump change, for sure, but way short of a million dollars,” she says. I agree that the numbers won’t add up as much as we’d hope since we find other ways to spend the money. Still I wouldn’t say it’s been debunked. Cutting back on the daily spending does pay off considerably. It just depends on if we are disciplined enough to properly redirect that money.